The functionality is a feature of Webix Pro edition. The extension is based on Webix suggest list. It redefines the default dropdown menu for RichSelect, Multiselect, Combo, Multicombo controls as well as similar editors. 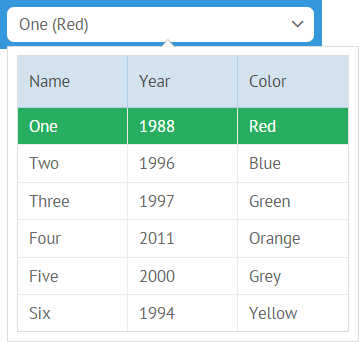 GridSuggest extension makes it possible to use Webix datatable in a dropdown menu while by default Webix list is used. GridSuggest can be used with select controls. 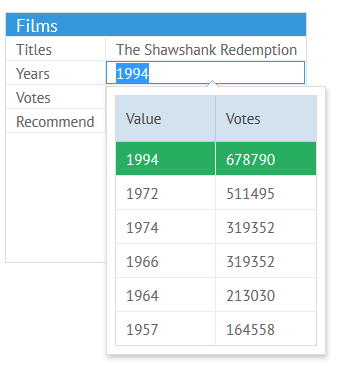 With GridSuggest extension you get the possibility to define view used for a dropdown menu as well as set its configuration, both for combo and richselect. body (object) - set of configuration options for a suggest datatable. Such code will show a datatable with borders while the columns will be generated for all data values from the dataset except for the ID field. columns (array) - used instead of autoConfig, allows for setting an array of columns for the datatable. data (array) - data for the options to choose from. If you use body property for gridsuggest configuration, data should be defined inside it. GridSuggest can be used as a component editor as part of combo or richselect editor.